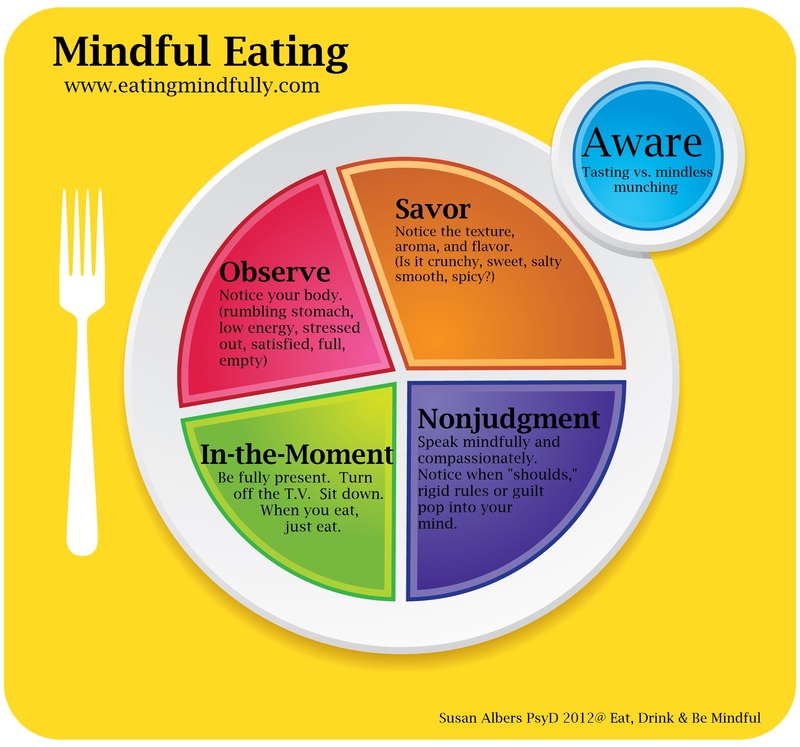 Mindful Eating: Part One - Naked Eating Practicing mindful eating is an empowering experience that allows us to slow down, taste our food, and make decisions that support us to feel our best. Are you interested in losing weight, gaining control over what you eat, kicking the diet mentality to the curb, freeing your mind from feelings of guilt associated with food, and finding peace with food so that eating is an enjoyable and nourishing experience? Learning to eat mindfully is a positive practice that will support you in achieving these liberating changes. This week I was chatting with a fellow registered dietitian and we were discussing how difficult it can be to practice mindful eating even when it is something that we talk to our clients about all the time! Sometimes, I don’t even realize I’ve finished my dinner until I look down at my plate because my mind is churning through a to-do list or I’m making sure Little Miss isn’t practicing her trademark windshield wiper dance move that only comes out for meals and the wheels on the bus. Another common struggle I hear from my clients (and experience myself) is controlling sweets intake. I mean, is it humanly possible to eat just one cookie when you have a dozen piping hot homemade little morsels calling your name?! The answer is yes; enter, mindful eating! Luckily, the food is in her belly and our floor is only covered in a lovely fresh citrus scented sticky juice. Becoming aware of WHY and WHAT you are eating so you can make a CHOICE that is best for you. Before you put something in your mouth ask yourself why you are eating. Is it because you are hungry, bored, sad, happy, anxious, etc.? Notice what type of food you are going to eat. Then decide if you want to eat it, choose something different or walk away. The key here is that you are making a conscious decision about what you eat instead of eating mindlessly in response to emotions or out of habit. That means that no food is forbidden; you get to decide how to balance what and how much you eat so that you can honor your health goals, feel satisfied, and enjoy eating. Connecting with the benefits that balanced and healthy eating brings to your life. Notice how it feels both mentally and physically to eat with intention. For example, you might feel more energetic, lean, less bloated, more focused, empowered, or notice that your sleep improves. Connecting your mind with your body to determine when you are hungry and when you are satisfied. This is a tricky one as some of us have lost the innate cues we are born with that signal us when to eat and when to stop. For information to rediscover your natural body signals for hunger and fullness check out this link. Being present to the process of eating and becoming aware of all your senses involved. This means bringing our full attention to the eating and drinking experience. Noticing the smells, textures, flavors, temperatures, sounds and even the details of what your food and drink looks like (colors, shapes, arrangement, etc.). Mindful eating doesn’t mean that you can’t enjoy the ambiance of a restaurant or an engaging conversation. However, it does mean doing your best to be present to the experience of eating instead of mindlessly scooping food into your mouth until your plate is clear. Noticing judgmental or critical thoughts that arise when or after you eat. Bring awareness to negative thoughts that come up when or after you are eating and gently dismiss them while refocusing on the intentional choice you have made and then refocusing your awareness to eating. If judgmental thoughts arise after eating mindlessly try to reframe the thoughts in a way that is kind to yourself and supports moving forward. For example, after stopping the negative thought you might acknowledge your self awareness and ability to stop that thought and then ask yourself what you might do differently next time to support mindful eating. Coach’s Corner: Journal time! If you are currently working on a wellness goal(s), reflect on how it is going and what you are noticing (benefits, challenges, etc.). Moving forward, what goal(s) will best serve you? Maybe it’s practicing consistency, making changes or dropping some/all goals. What is an activity that you already do mindfully? Some examples include practicing yoga or playing a sport, working on a project at work that has an upcoming deadline, playing an instrument, etc. What makes you successful with being fully engaged and aware when doing this activity? How might you translate those skills to eating mindfully? What is one way you can support yourself to be a more mindful eater this week? For example: I will try taking two bites with complete attention every time I eat. Mindful Eating: How to really enjoy your meal. « 25+ Easy Salad & Salad Dressing Recipes To Go With Any Meal! Practicing mindful eating is an empowering experience that allows us to slow down, taste our food, and make decisions that support us to feel our best.